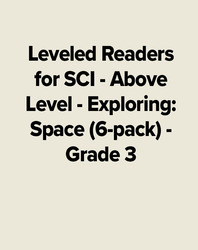 Leveled Readers for Fluency is structured to increase fluency and accuracy by providing students with the opportunity to practice reading at their own level. Theme related books at three readability levels; Easy, Average, and Challenge address the individual needs of all students. Whether used for independent reading or in small, flexible groups, Leveled Readers for Fluency builds fluency and strengthens students' reading and comprehension skills.